My goal is one shared by a multitude of HR professionals around the globe. Because the HR manager deals directly with employees from their first day on the job until their last, ethics is an integral part of the HR function. The challenge, of course, consists of those ethical conundrums and challenges that, although not codified in an entity’s ethics policy, nevertheless play themselves out on a daily basis. Ethics is not the same as feelings. Feelings provide important information for our ethical choices. Some people have highly developed habits that make them feel bad when they do something wrong, but many people feel good even though they are doing something wrong. Ethics is not religion. Many people are not religious, but ethics applies to everyone. Most religions do advocate high ethical standards but sometimes do not address all the types of problems we face. 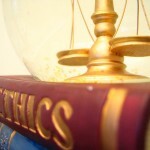 Ethics is not following the law. A good system of law does incorporate many ethical standards, but law can deviate from what is ethical. Law may have a difficult time designing or enforcing standards in some important areas and may be slow to address new problems. Ethics is not following culturally accepted norms. Some cultures are quite ethical, but others become corrupt or blind to certain ethical issues. “When in Rome, do as the Romans do” is not a satisfactory ethical standard. Ethics is not science. Social and natural science can provide important data to help us make better ethical choices. But science alone does not tell us what we ought to do. Unlike our private sector counterparts, violations of public entity ethics policies have a habit of becoming front page news. Consequently, for every ethical violation that appears in the media, the public’s confidence in its elected and appointed officials erodes a little more. • Failing to state and enforce basic ethical/integrity principles in the overall HRM strategy and policies leaves HRM void of ethical/integrity direction. • Failing to outline and enforce limits on political and personal influences, thus safeguarding transparency, allows such influences to penetrate into HRM decisions. • The absence of clearly stated and enforced policies to promote professionalism in HRM allows the whole system to be vulnerable to malpractices and corruption. • A lack of a code of ethics, guiding and enforcing the standards of HRM units and employees can lead to a lack of accountability. Employees are a public entity’s greatest resource. Investment in employee and supervisor development can lead to a host of benefits including an ethical workplace culture that enjoys the faith, trust and confidence of the citizens it serves. HR must take the lead in promoting an ethical and respectful work environment that goes beyond regulatory compliance. It can best accomplish this by reaching out to all the component parts of the organization and by consistently reinforcing the ethical policies and procedures that affect all employees and the citizens they serve. Author: Joseph G. Jarret is a public sector manager, attorney and mediator who lectures full-time on behalf of the master of public policy and administration program in the Department of Political Science at the University of Tennessee, Knoxville. He is a former United States Army Armored Cavalry Officer with service overseas and was the 2013-14 president of the E. Tennessee Chapter of ASPA. Jarret holds the B.S., MPA and J.D. degrees and is currently pursuing a Ph.D. in educational leadership & policy studies. Not to minimize ethics, but perhaps a mini-sense of humor can also drive home the point. Anyway, I am sure you can find more.